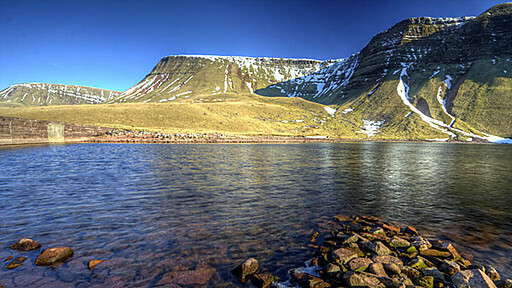 "The Lady of The Lake" and "The Magicians of Myddfai"
In the 12th century a young man fell in love with a woman who emerged from the magic lake – Llyn y Fan Fach, in the hills above the village of Myddfai. He was allowed to marry her providing he was faithful, didn't give her three needless blows, nor touch her with iron. She came with a dowry of goats, cattle, sheep and horses. They were very happy and she bore him three sons. She cried,“You have struck me the last blow. Farewell!” Turning her back on him, she called to the animals to follow her, and disappeared into the lake. The distraught husband drowned in the deep waters of the lake in his frantic search for her. The lady’s three sons often went to the lake, and one day she re-emerged and told Rhiwallon, the eldest, that he must become a man of medicine and be "a benefactor to mankind by giving relief from pain and misery through healing all manner of diseases". Coarsely powdered mustard seed boiled with figs in strong ale – also for rheumatism, chilblains, and for preventing drunkenness. 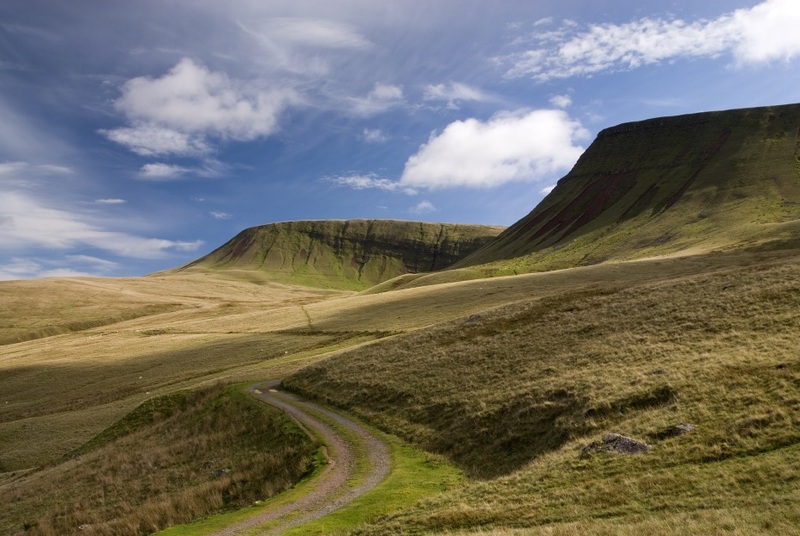 It stretches from Llandeilo in the West to Hay-on-Wye in the east, covering 519 square miles (1344 km², 332 100 acres) and encompassing four main regions - The Black Mountain (which rises behind Lothlorien Cottage) in the west, Fforest Fawr (Great Forest, also near the cottage) the Brecon Beacons in the centre, and the (confusingly named) Black Mountains in the east..Lothlorien is a BreconBeacons cottage at the western edge of the National Park. 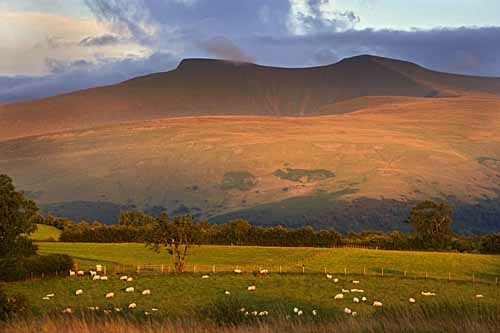 At their heart is Wales’ largest expanse of open hill common, about 20 miles across. 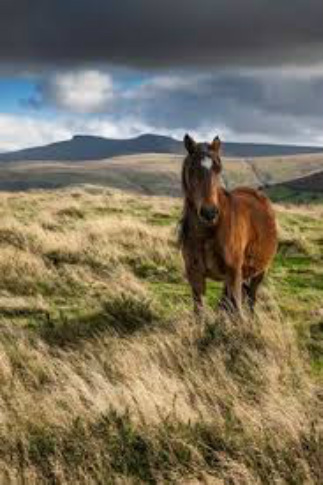 Here, Welsh mountain ponies keep the vegetation in check. The descendants of pit ponies, they’re a hardy breed. They’re said to be tougher than sheep – and less fussy eaters. 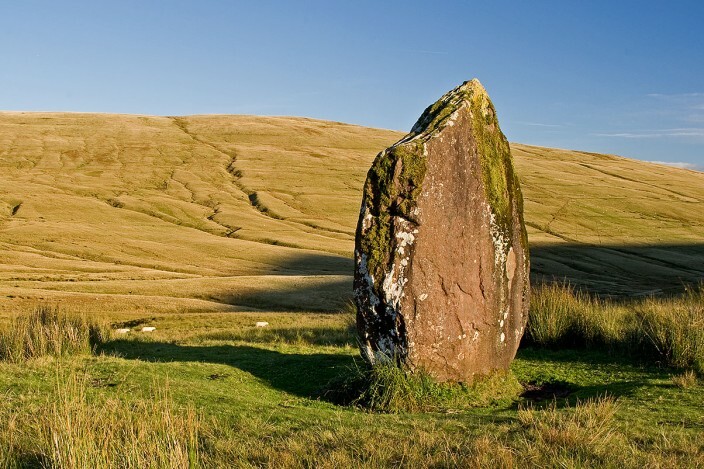 The nearby village of Brynamman (5 minutes drive) on the Black Mountain, is known as the Western Gateway to the Brecon Beacons and the mountain itself is full of fascinating archaeological sites and wonderful pathways for walks on the doorstep of the accomodation. 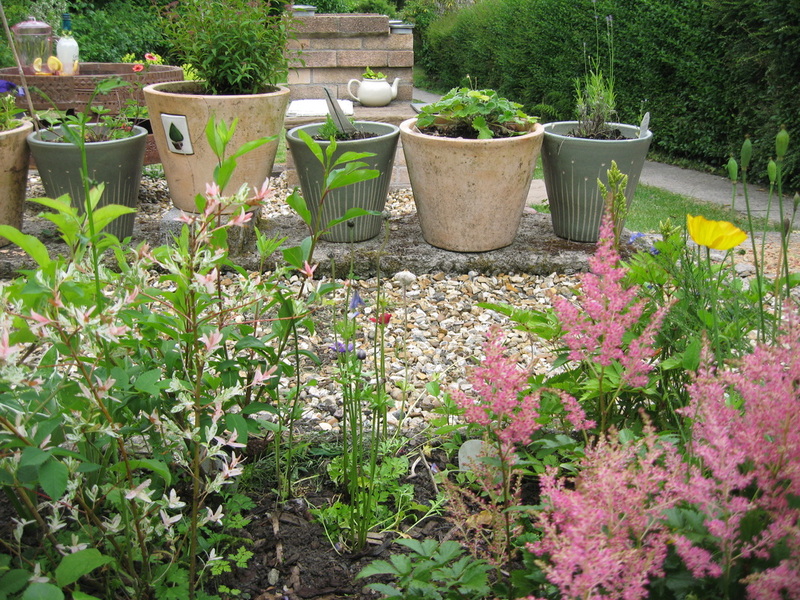 A self-catering holiday is an ideal way to explore and to experience as many of the activities in the area as you can. Activities in the Park include walking, cycling, mountain biking, horse riding, as well as sailing, windsurfing, canoeing and fishing, rock climbing, hang-gliding, caving and birdwatching. 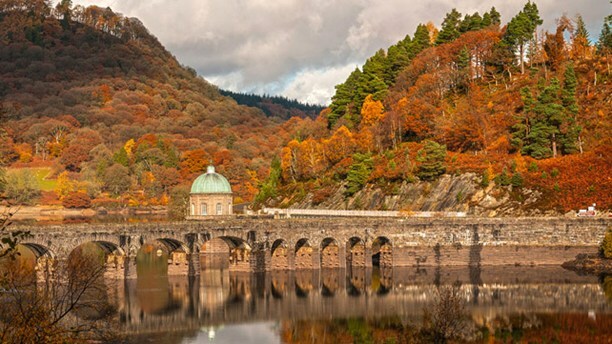 Most of the National Park is bare, grassy moorland grazed by Welsh mountain ponies and Welsh mountain sheep, with scattered forestry plantations, and pasture in the valleys. 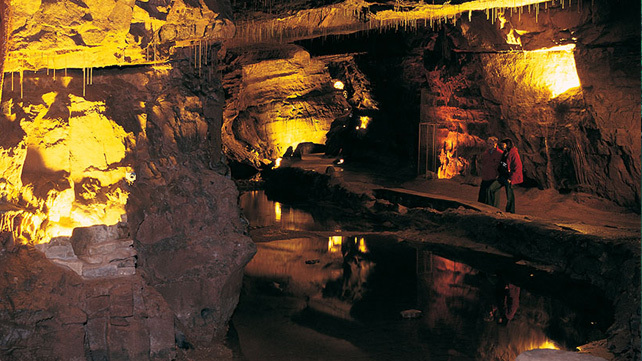 It is known for its remote reservoirs, waterfalls including the 27-metre Henrhyd Waterfall and the falls at Ystradfellte, and its caves, such as Ogof Ffynnon Ddu. 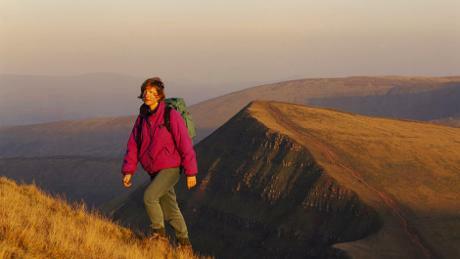 The Brecon Beacons Mountain Centre was opened in 1966 to help visitors understand and enjoy the area. Although commonly referred to as ‘The Welsh Robin Hood, Twm Siôn Cati (c1530-1609) deserves better respect. He was of noble blood, a poet and a heraldic bard of renown. Many of the escapades attributed to him probably flowed from the imagination of various novelists. According to recent research, it is possible that he hid in the famous cave at Rhandir-mwyn to escape religious persecution rather than to avoid the wrath of people who had been tricked by him. 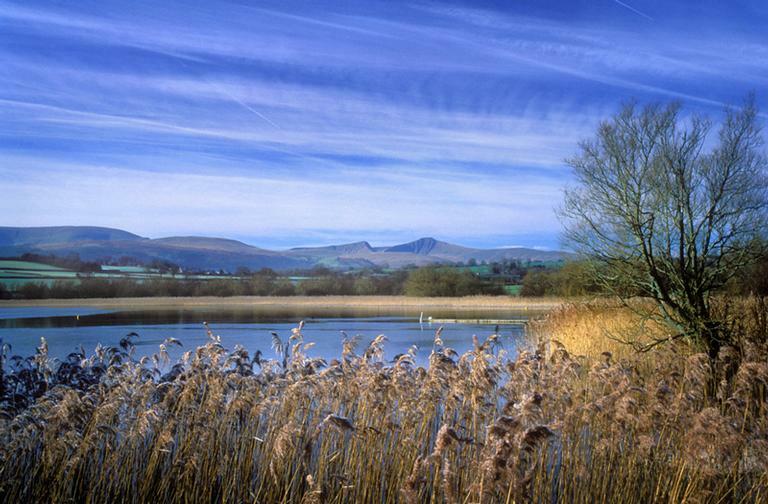 This area sometimes known as the Land of the Sleeping Giant, as the distinctive profile of the Cribarth mountain looks like a giant on his back catching forty winks. 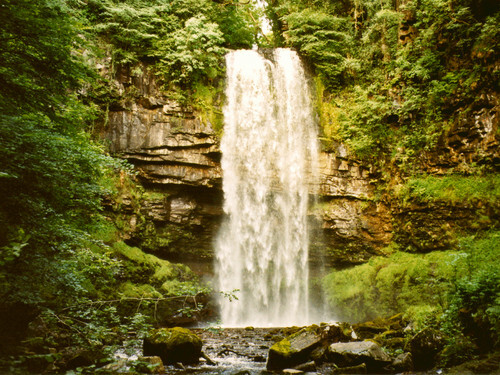 Another dramatic natural sight is the Henrhyd waterfall, at 27 metres the highest in South Wales. 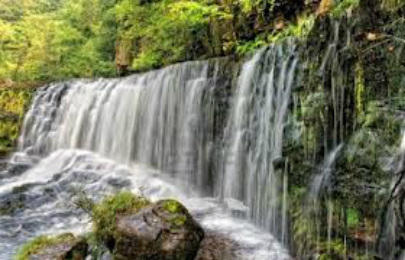 A steep walk takes you to the foot of the falls and you can then follow a path further downstream through a wonderful ‘Celtic rainforest’ to where the small fast flowing Llech joins the Tawe, passing an old woollen watermill known locally as the ‘TheFactory’. An audio trail on the route tells stories of the area and gives ample opportunity to rest and take it all in. The romantically named Craig-y-Nos Castle, translates as ‘rock of the Night’, is now a hotel but in Victorian times was home to Madame Adelina Patti, a world famous opera singer whose voice was renowned for its incredible purity. Inside there is a beautiful Grade 1 listed theatre built by Madame Patti and it is reputed that her ghostly voice can sometimes still be heard. 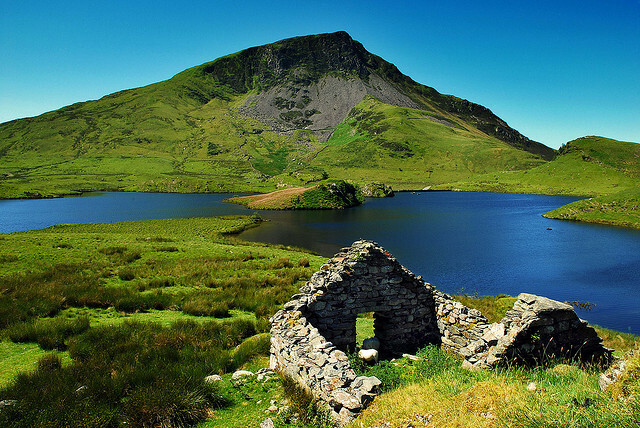 surviving medieval castles in Wales and was home to one of the early Welsh kings, Rhys ap Gruffyd. 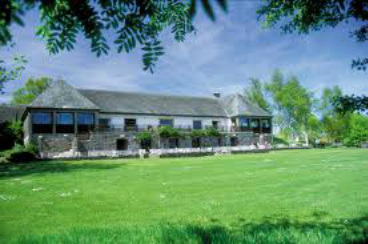 The famous Carreg Cennen Castle is also nearby, as are the National Botanic Gardens, Aberglasney and Newton House. Llandeilo's most famous son was Sir Rhys ap Thomas, a nobleman who slew Richard III at the Battle of Bosworth. 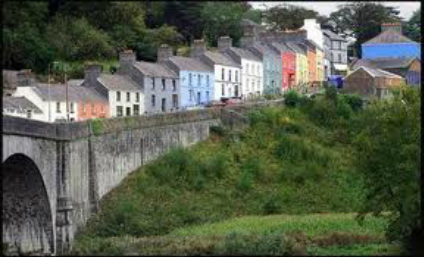 It should not be forgotten that Llandeilo is one of the prettiest towns in Wales, a quaint and charming place with friendly locals, superb inns and a thriving farmers market as well as an annual Jazz Festival. 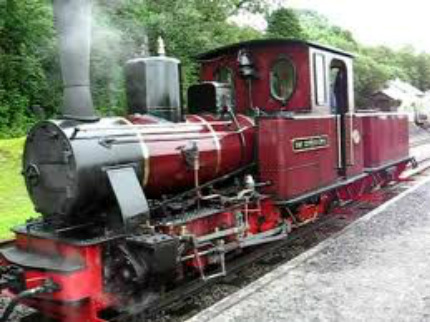 Llandeilo has a railway station on the Heart of Wales line that runs from Shrewsbury to Swansea. LLandeilo lies 30 minutes to the north of Lothlorien cottage,self catering accommodation within the Brecon beacons National park and is a pretty and picturesque small town full of quaint and unique shops and places to eat including Heavenly which is in the top ten places for ice cream in the United Kingdom.Push open the door of Heavenly, on the main street of pretty market town Llandeilo, and step back in time. 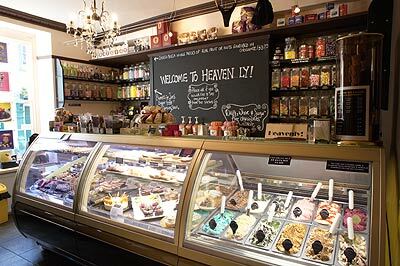 The shelves of this little shop are jam-packed with jars of old-fashioned sweets, chocolate treats, desserts and patisserie - and to-die-for ice cream. Inspired by her travels to Rome, owner Tracey Kindred and her team use Welsh organic milk and cream to make gelato-style ice cream on the premises to no less than 300 recipes (though they’re not all on sale at the same time). But give Heavenly a week’s notice and they’ll whip up any flavour you like - lobster and chips must be the wackiest to date. Even pooches are catered for with a doggy-friendly variety. Contact: Heavenly, Rhosmaen Street, Llandeilo SA19 6EN. 01558 822800 | heavenlychoc.co.uk | Facebook: Heavenly Exquisite Desserts. 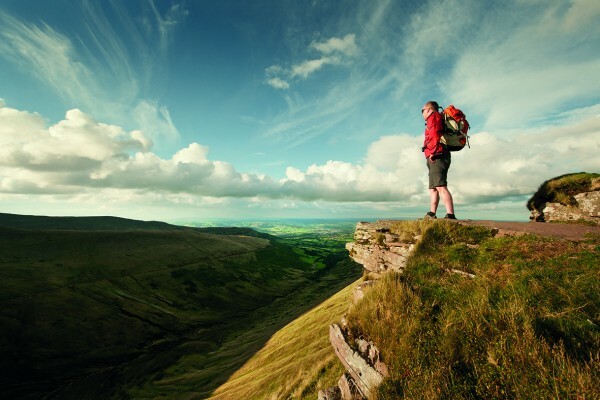 In Brecon and its surrounding area there are many interesting opportunities for outdoor activities and leisure facilities including walking, climbing, canoeing, horse riding and many more. 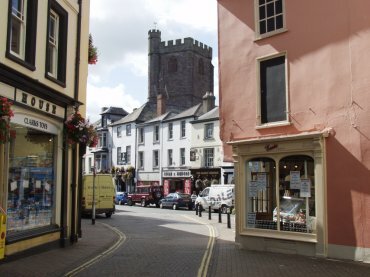 Brecon remains first and foremost a traditional Mid Wales market town - as you will see on any Tuesday or Friday! Reservoir OS 835285 N51.56.58 W03.41.55The car park area at Usk reservoir is a beautiful place to have a family picnic as well as an ideal place to enjoy outstanding dark skies. The large flat area allows set up of telescopes and the road access from Trecastle means it is easily accessible. This area enjoys a naked eye limiting magnitude of 6.4 and is protected from the light pollution of the South Wales valleys. 2. Crai Reservoir OS 886210 N51.54.52 W03.35.12This reservoir is not as accessible as Usk, but a short drive down an access lane allows the set up of telescopes to enjoy stargazing down to a limiting magnitude of 6.37. 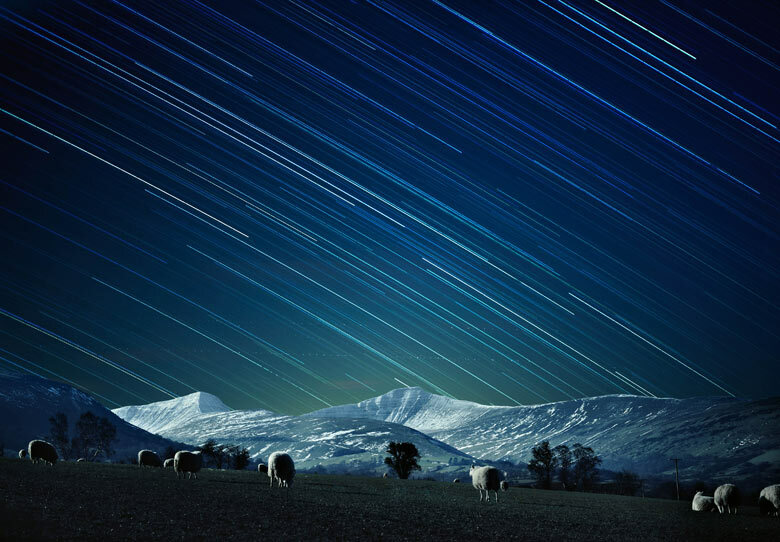 There are also laybys along the A4607 which provide ideal places to enjoy the beauty of the dark skies. 3. Llanthony Priory OS 288278 N51.56.41 W03.02.11One of the most beautiful ruined buildings in the care of CADW, Llanthony Priory has pristine skies and is situated along the Offa’s Dyke Path just on the Welsh-English border, with skies that have a limiting magnitude of 6.35. The priory is set in one of the most charming areas to observe in Wales. 4. Hay Bluff S 242361 N 52.01.43 W03.06.34The road over Gospel Pass from Llanthony to Hay-on-Wye brings you to the car park on Hay Bluff, a hill overlooking the Wye valley with great views over Powys and Shropshire to the distant north-west. The skies have a limiting magnitude of 6.34. The town of Hay is the largest centre of second hand bookshops outside of London, making this a good place to look for astronomy titles. 5. National Park Visitor Centre (Mountain Centre) OS 878264 N51.56.02 W 03.28.40The visitor centre is signposted at the village of Libanus on the main A470 road and is very accessible both day and night. 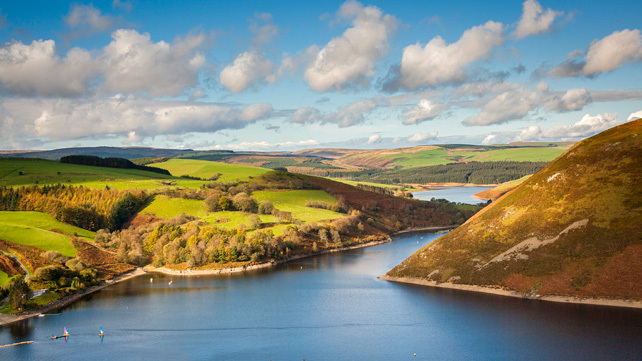 Enjoying skies with a limiting magnitude of 6.37, the centre is one of the best and most accessible areas to set up telescopes and is within an hour’s drive of every one of the South Wales valleys. 6. Pen Rhiw Ddu OS 730192 N51.51.13 W03.50.31The car park off the winding road between Llandeilo and Brynamman over the Black Mountain is a great location as there is good access from the Swansea Valley and plenty of room for telescopes. It also overlooks the darkness of Mid and West Wales with the skies here enjoying a limiting magnitude of 6.31. 7. Carreg Cennen OS 668193 N51.51.12. W03.56.02The wonderful castle at Carreg Cennen sitting on its huge limestone cliff offers a great day out with breathtaking views across the valley to the west and one of the darkest skies in the region at a limiting magnitude of 6.26. 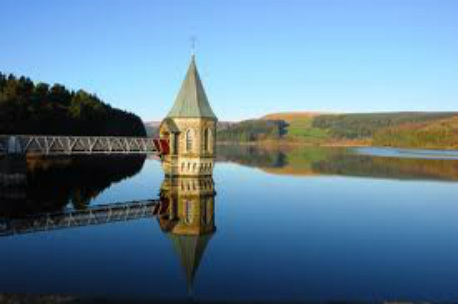 It is accessible from Llandeilo, Carmarthen and Ammanford and is within an hour’s drive of the South Wales valleys and the rural heartland of West Wales. 8. Craig-y-nos Country Park and Craig Y Nos Castle OS 840161 N51.50.16 W03.40.29Craig-y-Nos Castle is the former home of opera singer Adelina Patti, one of the greatest sopranos in history. The skies here have a limiting magnitude of 6.30 and are very accessible by road from Swansea and Brecon. 9. Sugar Loaf Mountain OS 272187 N51.50.30 W03.03.34The hill dominating the skyline from Abergavenny is accessible off the main A40 road. The limiting magnitude here is 6.10 and you enjoy a wide view over the south and west whilst avoiding much of the light pollution of the towns to the south. 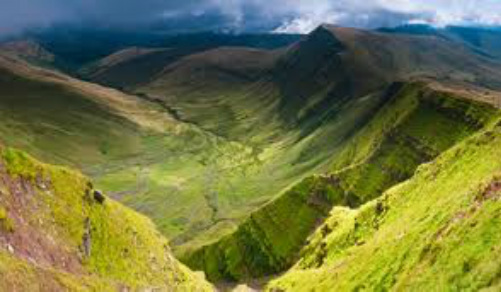 The Brecon Beacons are named after the practice of lighting signal fires (beacons) on mountains in the area to warn of attacks by the English, a practice used in modern times more for celebratory purposes and the commemoration of national events such as coronations or the Millennium.
" 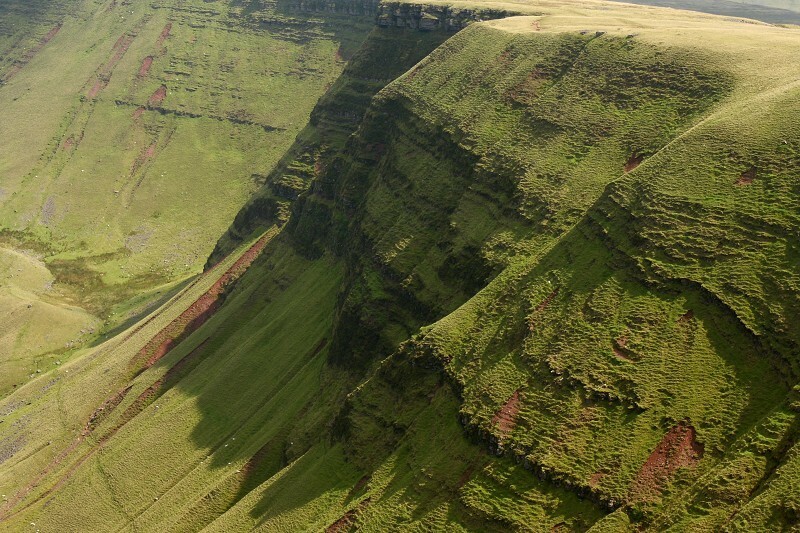 Brecon Beacons" refers to the mountains south of Brecon, the summits of which form a long horseshoe around the headwaters of the Taff Fechan river in the south-east, with long parallel spurs extending north-west.The highest of these is Pen y Fan (886 m); other notable summits include Corn Du (873 m), Cribyn (795 m), and Fan y Big (719 m).